In case you haven’t heard yet, Facebook has implemented a new change and now marketers worldwide are sitting around conference tables trying to figure out how to handle this. It may seem like I’m making fun of those people, but I’m really not. We did the same thing. Plus, we did try to warn you that they were testing this strategy, and we’ve been keeping you updated on some of Facebook’s other changes leading up to this. We also included a little bit of this info in our 10 Digital Marketing Trends for 2018 That You Should Know. But I digress. Long story short, Facebook is going back to their roots and doing what they did best: Connecting people. You can read Mark Zuckerberg’s long, well-written, rant here. Facebook will be preventing posts from business pages from showing up on your News Feed. Promoted, sponsored, or boosted posts won’t be affected, but for the most part you will only see posts from your Facebook friends, any Facebook groups you joined, and any business page you have manually selected to see. Learn more about how to adjust your News Feed Preferences here. For the past few years, and as I’ve probably mentioned in many other blogs, I have long been an advocate for engagement. Social media stopped acting as ‘networking platforms’ when channels started letting you pay to boost or sponsor your posts. Many marketers have tried to convince their teams and higher-ups that talking to people is important, using social media acts as a form of customer service, and building relationships leads to conversions, partnerships, and more. However, you try walking into your boss’ office and saying, “I’d like to spend more time on Twitter and talking to people in Facebook groups,” and you let me know how well that conversation goes over. Fortunately, for both users and marketers like me, the importance of building relationships continues to grow. Users, consumers, audiences, or whichever term you want to go with that means ‘people’ are getting more annoyed with your sales pitches. Your Facebook news feed turned into the middle kiosks at the mall where people try to get you to try a lotion or let them fix your phone. Don’t get me wrong, we, as a marketing agency, enjoyed being apart of your newsfeed. However, we’re #TeamPeople in this venture. We want to talk with you, and build relationships with our audiences and those of our clients. Sure, we could just ramp up our budgets and tell our clients we need more money, but that’s the easy solution and here at Farmore, we don’t do easy. We do what works, we trust our processes, and when needed, we exercise patience. This all being said, let’s get to why you’re really here: How you can stay relevant on Facebook without having an organic audience. They exist. They happen daily. They’re awesome. Stay tuned for our blog about Twitter chats coming out in February. For reference, at one point we reached more than 40k impressions from a single Twitter Chat. These have proven to be great at quick results, but they require 100% reciprocation. Meaning you have to do what you say you’re gonna do. Find relevant Facebook groups that you can join with your personal profile. Depending on your industry, you can find several groups that are all very engaging and are all about helping you grow, answering your questions, and showing support. Ask your audience when sharing an article or update something like, “What are your thoughts?” or invite them to share their insight or suggestions. Your digital version of networking events. LinkedIn Groups are fantastic at talking about industry news, sharing relevant company updates, and talking to people all around the world who share your business’ values and philosophies. As an added effort, ask your employees to spend some time doing this, too. LinkedIn is all about professional connections, so utilize the resources LinkedIn provides. You can now follow hashtags. Follow hashtags relevant to your brand, business, product, industry, etc. Reach out and engage with new posts, and explore users when you see recurring posts that you like. Instagram is one of those platforms where people don’t get too upset if you’ve scrolled down three years worth of posts. It means they kept you interested enough to keep scrolling. Pro-Tip: Start with looking at your posts and seeing who liked them. Explore their profiles and if they seem like they’re your ideal customer, follow them and like a few of their posts! They’ll be so excited! Your employees are happy to work with you and for your company. So ask them to take some time to go on your Facebook page and share some of your recent posts. This might be a great time to start adding employee spotlight related posts to your social media strategy if you’re not already. What better way to get your employees interested in checking your channels than to make it about them! Show some behind the scenes photos or videos, and share your company’s culture with the world. If you’re able, and open to the idea, a person you can hire or a role you can fill are either a Community Builder/Developer or a Chief Engagement Officer. This person will be the “face,” and more importantly the voice of your brand. Hire or promote someone who, in your mind, embodies the brand, sounds like the brand, understands the brand, and can be the brand. It’s important at this stage to get the mindset around the idea of “playing on Twitter all day” out of your world. A Community Developer or CEO’s whole job is to literally get online and talk to people. So let them. I would bet that by the end of 2018, this type of role will be just as important, if not more so, than your standard sales person. What are your thoughts on Facebook’s newest change? Do you think more changes are on the horizon? Let me know on Twitter @FarmoreInc or @krystalblais! Krystal's background ranges from public relations to SEO strategy to social media management. 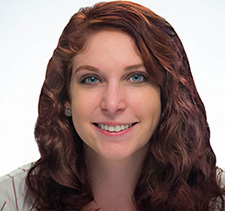 She believes her journalism concentration from her Mass Communications degree from the University of South Florida St. Petersburg leads her to better understand the marketing industry and how to communicate with people both in person and digitally. Krystal likes puns, hula hooping, comic collecting, and socializing or attending networking events.